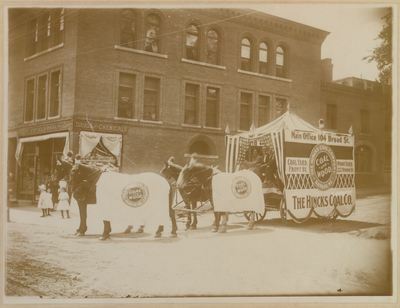 "The Hincks Coal Co. Bangor Carnival Parade Float, June 18, 1912"
The Hincks Coal Co. sold coal and wood. Main office for the company was at 104 Broad Street, while the coal yard was at 50 Front Street, and the wood yard at 222 Broad Street. The 1912 Bangor city directory does not provide any additional information about the company, such as the owner or otherwise. This building is currently the location of the Bangor Area Homeless Shelter.